Provide mediation services to disputing parties, document contact with clients on appropriate forms, conduct necessary follow-up with disputants, provide resources and referrals, assist with special projects or events as needed, and attend advanced trainings. 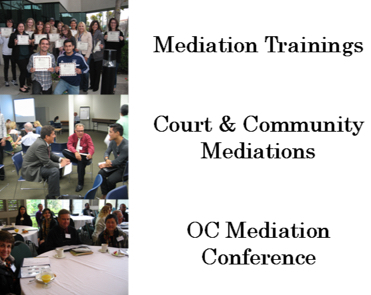 Skills and Qualifications: Mediation training is required in compliance with state standards as defined in the California Dispute Resolution Programs Act of 1986, Business and Professionals codes EC.465, et seq. Volunteers must be 18 years or over. Bilingual capabilities welcome. Hours and Locations: No minimum weekly or monthly commitment required, Flexible scheduling. Dispute Resolution Services locations: Central Justice Center (Santa Ana) and Harbor Justice Center (Newport Beach). Monday through Friday, 8:00 a.m. – 12:00 p.m., occasional afternoons or Saturdays.